Romantic books from Italy : 'Letters to Juliet'. Buyer beware : this is not the book of the film. But in our view, it’s better than that. Because it's the real life story behind the film. 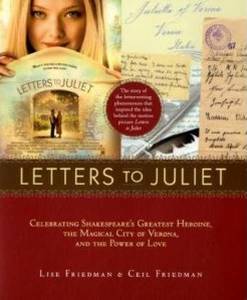 Featuring some of the hundreds of letters written each year to 'Juliet, Verona', it explores the history of Shakespeare's original play, the beautiful buildings in Verona with a connection to the story, and most of all and look behind the scenes at the 'Secretaries of Juliet' - the volunteers who reply to every letter written to Shakespeare's heroine. As the subtitle suggests, this book is a celebration not just of Juliet, but of the magical city of Verona and of love itself. As a bonus it includes a recipe for 'Baci di Giulieta' - 'Juliet's kisses'. Early editions included notepaper and an envelope to write your very own letter to Juliet, and although later editions no longer do there is nothing to stop you from finding your own stationery and writing - and, of course, you'll receive a reply. A great gift for the one you love; a must-have book for romantics everywhere; a feel-good buy for anyone who still believes in the power of love. If you’re in Milan and would like to take a romantic day trip to Verona to see for yourself Juliet’s house and the famous balcony, have a look at this imaginative excursion from our partners, Viator. It includes a two-hour walking tour of this gorgeous city with an English-speaking guide. As well as the famous Shakesperian sites it includes the famous Verona Arena and a visit to the lovely lakeside villages on Lago di Garda on the way back. to take you directly to a booking page. If you’re looking for the film of the same title, this link will take you to Amazon.com where you’ll find the most competetive price on the internet for the DVD of 'Letters to Juliet'. to more Italian romantic books.